The new year has come and we’re all here to see another day in paradise. And with several changes happening to my work flow in the coming weeks, it’s time to switch up the tech to make my workflow move seamlessly. 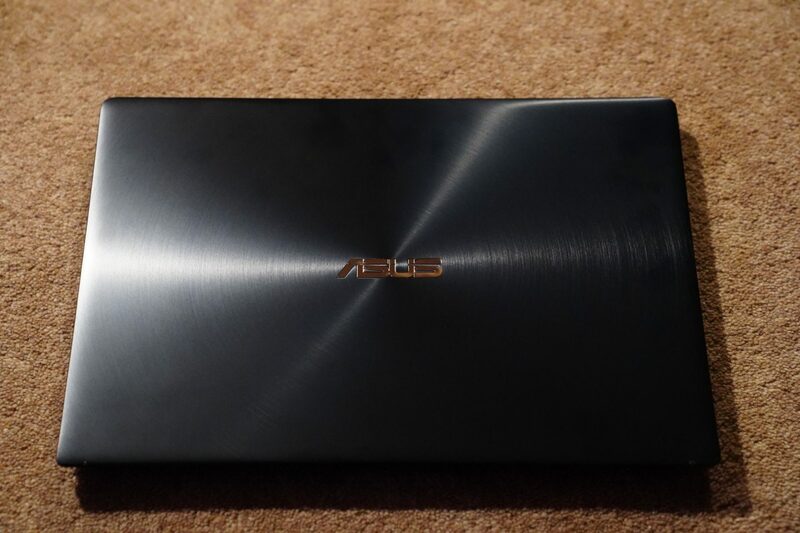 So we begin the new year looking around for a new laptop, with my search starting with ASUS. A brand which doesn’t need much introduction, given its track record for delivering some impressive products over the years. Where I run a heap of databases, put together presentations and edit tons of images, my computer requirements are quite high to handle the demanding tasks. And within the range, the Zenbook Pro is the one that called out to me. 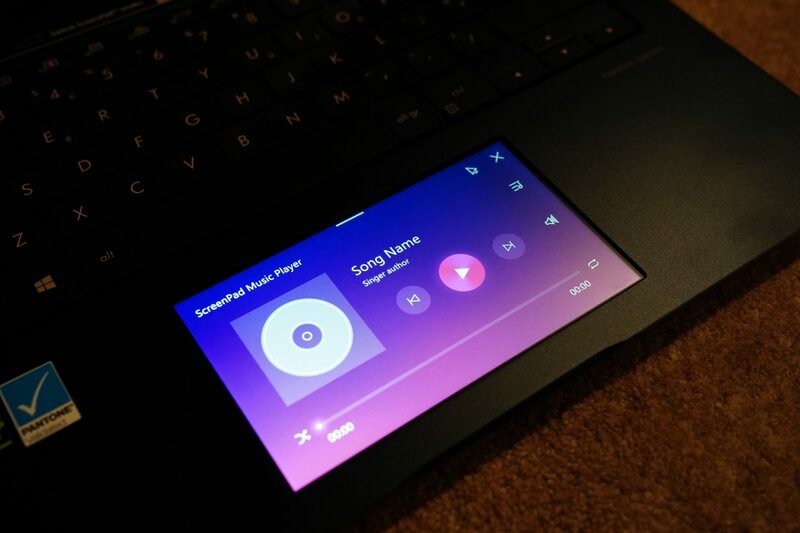 Pros: Incredibly fast, impressive touchscreen pad technology, good number of access ports, good looking machine. Display: 14” LED full HD screen. Performance is something we’re sure, will challenge some of the best laptops on the market, packing the superior I7 processor. Add in the large volume of RAM and storage space, and you’ll be saying goodbye to your slow computer days with one of these at the helm of your workspace. The I7 processor under the hood runs with a 1.8Ghz quad core, with turbo boost, giving you up to 4.6 GHz. With this level of power under the hood, it was hilariously fun to be able to handle lightroom and photoshop at the same time. To cope with the performance the Zenbook Pro comes packed with a 70Wj 4 cell lithium battery, which will give you up to 12.5 hours life. In reality I’d say you’ll probably get a good 9 hours use, haven used it to run adobe lightroom for hours. Which in today’s world I would not turn my nose to at all, that’s enough to get you through a full day shift in the office. The Zenbook Pro comes with its 14” LED-backlit Full HD 16:9 touchscreen, which delivers 1920 x 1080 resolution. All of this sits behind a uber thin 5.2mm bezel which gives you a lovely 86% screen to body ratio. Viewing angle sits about 178 degrees which again gives you a better experience whilst using the Zenbook Pro. My only challenge with this display is that whilst its pretty impressive, it stands slightly short in comparison to say, a similarly priced Surface Pro. This was always something I dreamed I could have, but never saw it come to pasture through the evolution of computing technology. 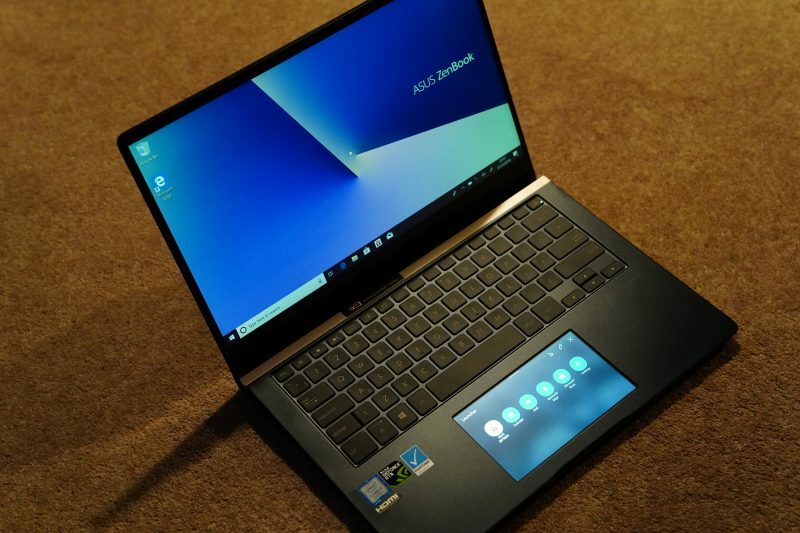 ASUS changed the dream to a reality, as they introduce a touch screen pad to their Zenbook Pro. 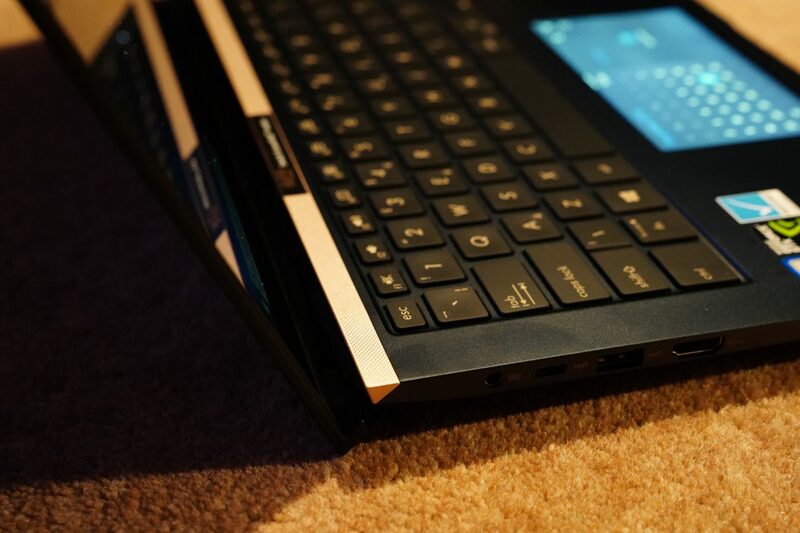 The Zenbook Pro design is something to be amazed, with its deep dive blue colour and brushed metal finish. Gorgeous to look at as you would expect from ASUS, but the brushed finish will mean heaps of finger prints in a matter of minutes (spent a good few minutes wiping it down) a small annoyance, but not one to completely throw it out of the title race of best laptop. When opening it up you’ll see the chassis moves itself into an upright position, allow for better circulation of air when in use. Small things like this is what makes the Zenbook Pro worth throwing some of your hard-earned money at. All in all, the Zenbook Pro is a seriously impressive notebook, which earns its title as Pro laptop. Majority of the features packed in are packed in for a reason, rather than being an unnecessary addition that just pointlessly drains the battery. 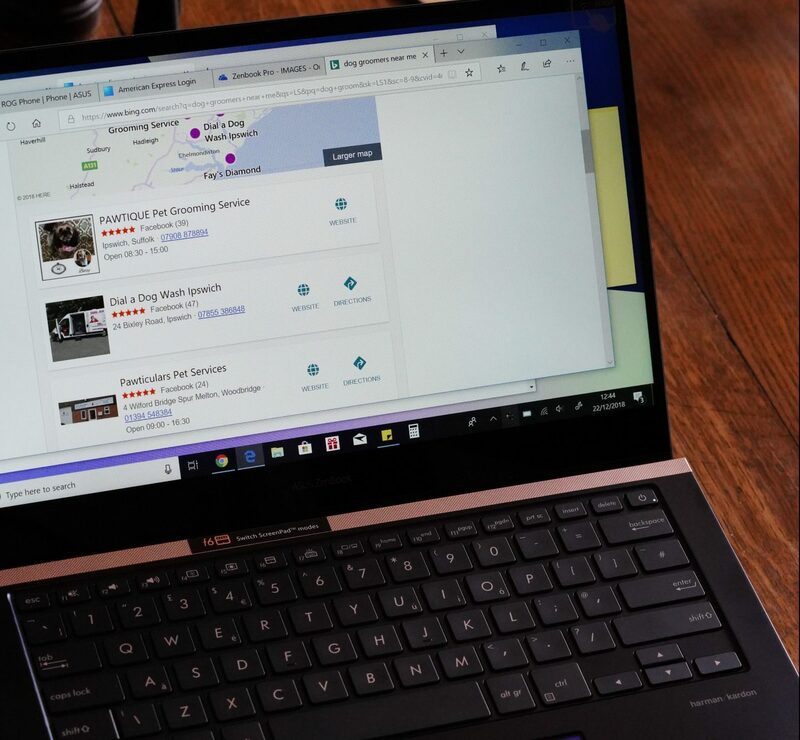 You’ll be able to grab the Zenbook Pro from most outlets like John Lewis, priced at £1299.